Excellent shot of the wonderful Venezia! Hi Roberto, I love this view. First of all, great idea to show in B&W and I really like the sharp contrast. Also the view is great, with the church steeple framed in the opening in the distance. Great shot. This could be featured in a coffee table book!!! fantastica questa prospettiva in B&W!Congratulazione! Long time I don't pass by your gallery! 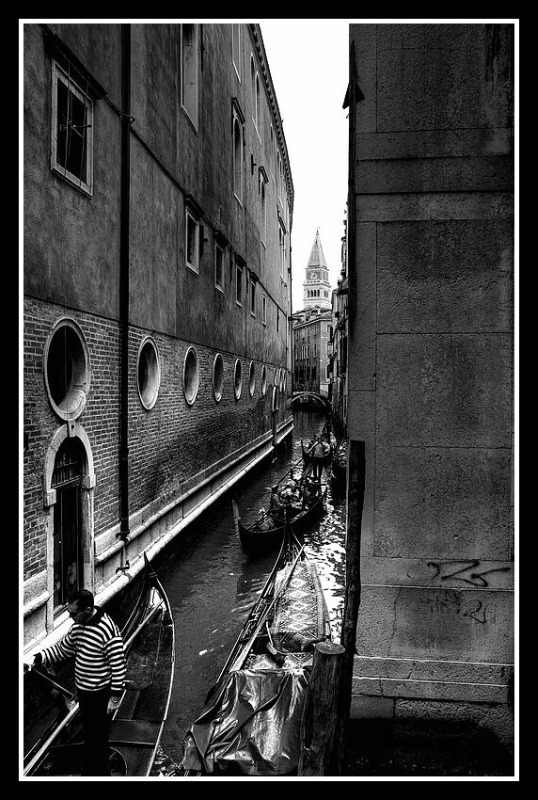 I like much this tight vertical composition on the narrow Venice Canal. This renders so well the impression I keep of this lovely city! Excellent B&W conversion. I prefer this timeless version at the other colored one! che bella questa prospettiva. Una foto molto ben pensata con un risultato davvero bello, ottimo B/N. narrow very narrow water street with an amazing perspective and great choice of B/W.. the gondolier with his striped shirt in the FG is a bonus in fact to create a contrast.. lovely details and perfect sharpness and texture! Wonderful and very well composed image with a superb mood and a great aesthetic effect.